All transactions are safe and secure with a reliable history in online purchasing behind each of our associates. 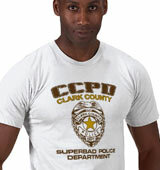 Buy the Superbad Clark County Police Department t-shirt to own Superbad clothing and merchandise. These Clark County Police Superbad tees pay tribute to Slater (Bill Hader) and Michaels (Seth Rogen), Clark County's finest. After witnessing a robbery, the officers question Fogell, who is terrified that they are going to discover his fake ID. Instead, they laugh at the fact that he is an organ donor. See matching Superbad hats and merchandise. In addition to the Superbad Clark County Police Department tee above, browse the Superbad Clothing Gallery for more apparel like men's and women's clothes, kids shirts or hoodies.